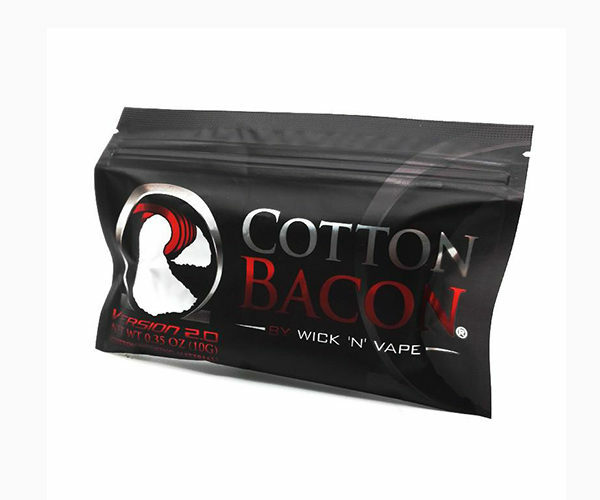 First of all this is the latest Bacon Organic cotton 2.0.
unwanted flavor to your vape. That is because is GMP certified, traceable and also medical grade cotton. Furthermore it gives you a clean taste every time your vaping. And finally in one bag you get 10 strips of cotton. In order to put the cotton on you atomizer you are also going to need some tools. Best for me anyway. Wicks last longer than organic and don’t scorch nearly as fast. I use cotton bacon v2 for over a year exclusively now and can highly recommend it. No influence on the flavor, no break in and works with all kinds of atomizers in both wattage or TC mode. Highly recommended.